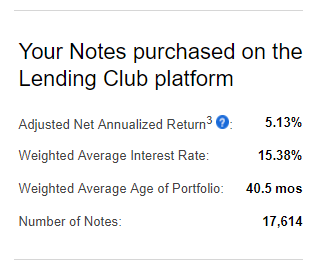 Are Lending Club's Statistics Pages Broken? Take a look at this set of charts. 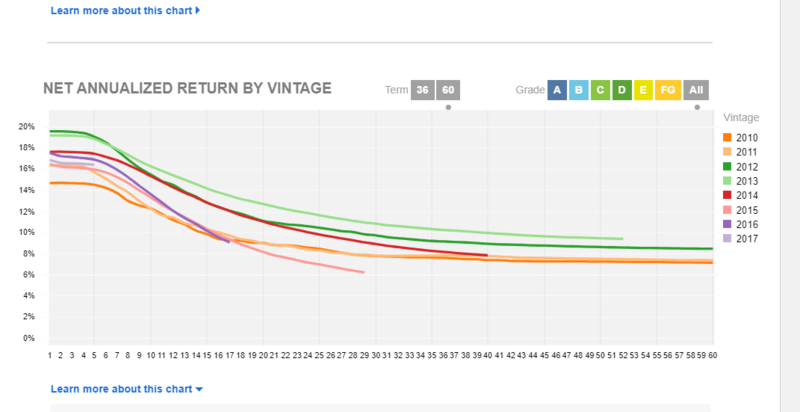 In particular check out the chart called "NET ANNUALIZED RETURN BY VINTAGE"
A: No new data since Q1 2017 -- RED FLAG note, this is as of 6/11/2018. Why do you suppose that is? Is it just an inconvenient truth that 2017 and 2018 are worse vintages than 2015 and 2016? Lending Club have been telling me they hit a bad patch of loans in 2015. If that's the case things are going from bad to worse. I guess I dont have to tell anyone on this forum how things are going for investors at LC. All I can say is that 2yr CD's at the local credit union are beating the pants off of Lending Club. 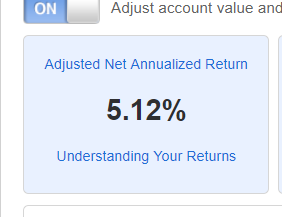 Re: Are Lending Club's Statistics Pages Broken? It may be the same as the issue with the quarterly vintage reporting that LC does, in the downloadable files. They don't start reporting on the vintage until the period is ended, and 2017 only ended a few months ago, and 2018 hasn't ended yet. Regarding 2yr CDs at the credit union ... I'm earning about 5% at LC these days, which is more than the local credit unions are paying. That's down a lot from what it used to be, and I wish it were higher, but it is what it is. Yes, I am quite sure. I calculate it myself, from my monthly statements. Just out of curiosity, what is the average age of your notes? ANAR is measured over the life of account. The negative dollar returns means that your ANAR has likely been falling this year, correct? I theorize that everyones NAR and ANAR has been dropping not only over the last year, but over the last 3 years. But the negative amounts I'm seeing are on the montlhy statements, which is merely interest in minus charge offs. This is what concerns me. It seems it is stuck in negative territory, meanwhile the ANAR reported on the web-site is reporting 5% interest. I know what the definitions of NAR and ANAR are and how the calculations are made. Its just such a huge difference that if even if ANAR and NAR are being calculated over the life of the loans, they will eventually be negative if chargeoffs exceed interest in the long run. So, back to my original question (is the website broken?). If it isn't maybe the business model is. Or the loan underwriting has gone horribly bad. But the negative amounts I'm seeing are on the montlhy statements, which is merely interest in minus charge offs. You should add in the 'Recoveries - Recovery Fees' to see your monthly end results. May make you feel a tiny bit better. It helps me.